Engineers and entrepreneurs have spent lots of time and lots of money developing what they believe are ideal coffee-brewing methods. But they have paid much less attention to ideal coffee consumption methods. Vacuum-sealed thermoses can keep your coffee nice and hot, but offer no way of actually controlling the temperature, making for sometimes scalding results. Now, though, an inventor and thermal engineer thinks he’s finally cracked the code, not on making the perfect cup of coffee, but drinking it. 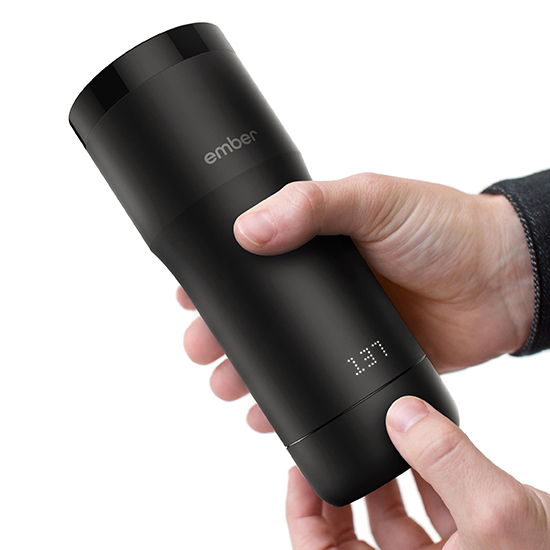 Via a cooling system at the top and a heating element at its base, Clayton Anderson and his team designed the Ember mug to keep your coffee at the ideal drinking temperature for hours at a time. To adjust the temperature, simply twist the dial on the bottom of the mug or (because we live in the 21st century now) use the accompanying Ember app to preset a temperature for different drinks. A bright LED screen shows you how hot the mug’s contents are so you know you won’t be in danger of coffee that’s too hot or too cold. And it doesn’t hurt that it looks good, too. The slick design comes courtesy of Ammunition Group, whose previous work includes Beats by Dre and the soon-to-be-delivered June Intelligent Oven. Trading in your I Hate Mondays mug will cost you. The Ember is currently available for order on the company’s Indiegogo page for $129, with expected delivery in April 2016. We know that sounds like a lot, so we’ll ask you about it again the next time you’re burning your taste buds off.